Having all the right accessories in your reef tank and setting them up is only half of the job, believe it or not. The other which is even more important is LED lighting set up. We implement it in order to amplify the beauty and attractiveness of our wonderful aquarium. If you’re looking to enhance the looks of the aquarium, why not choose the absolute best LED lights? If you ever had a dilemma, we’re here to solve it for you and help you find the best lighting for your aquarium. What Are Some Of The Benefits Of LED Lighting For Reef Tanks? Adding spectacular lighting to an already amazing aquarium can make everything looks much better and captivate the attention of passers-by, friends and family. Whether it is an aquarium of biological facility or your own home, LED lights have become a staple of all aquarium sets. There’s much more to know, and it’s not all about the benefit of looks. Let’s take a look, shall we? Only until recently, LED lights in reef tanks have become such an common sight. In fact, the type of lighting you were most likely to see was old-school metal halide lights or some form of weird, unnatural fluorescent lighting. The problem with these is that they were filled with metal parts and sensitive wires which could lead to fatal injuries to both the owners and the fish. LED lights are different from older models of illumination because they focus most of their energy on providing light, not heat. Therefore, the amount of lighting they generate is the ultimate choice for having a better reef tank. Technology has come a long, long way and now there are many variations of LED lights for reef tanks. 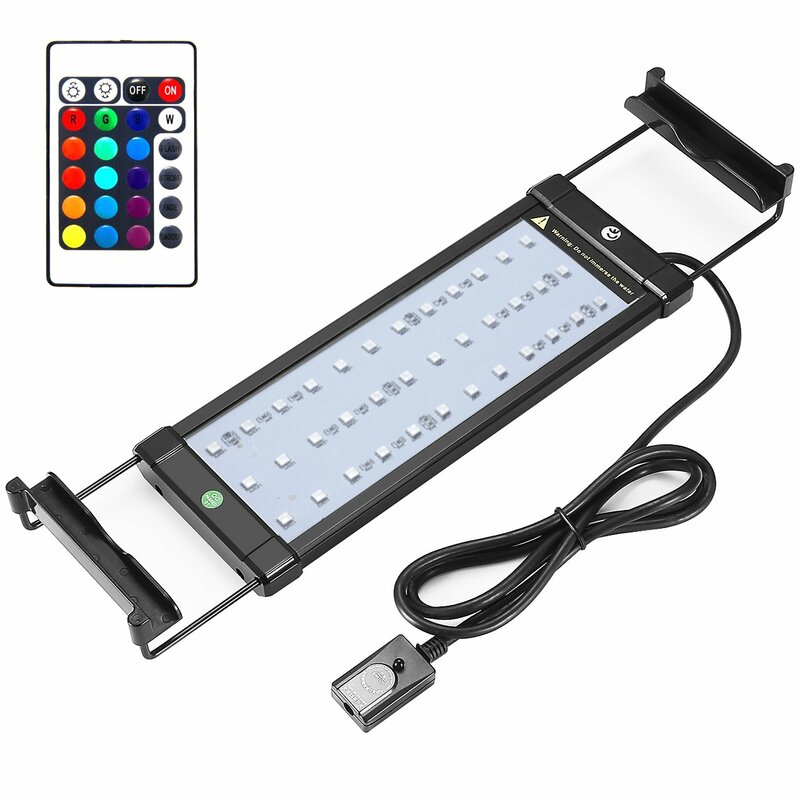 You can easily choose different colors, sizes, illumination intensity, and so on. There are even models which allow you to change the rhythm and intensity of the light. You can match the color of light with your sofa. So, no matter you place your aquarium anywhere; you have complete control over it. Sometimes, having lighting in your aquarium may alter the temperature of the water and mess with the fish. This can’t be further from the truth when it comes to LED lights. What’s different with them is that they focus much of their energy solely on lighting. Did you know that neon lights and regular bulbs spend an astounding 80% of energy only on heat production, and only 20% of actual illumination? Most think this is bogus, but there is scientific proof that LED lighting matches the sunlight better and allows water organisms to develop better and faster. A more natural environment means healthier fish and densely grown plants. A win-win, right? It’s crucial to know at which rate the LED lights expend electrical energy. Some brands don’t specify this on the product, and in such cases, you should disregard such brands. It’s important to know how much energy will be required to power the system. Some brands offer more complex and more powerful versions of LED lights for aquariums. This might lead to more complex installation processes. You should do your research online, on YouTube and inquire with the manufacturer. If you aren’t sure about whether you are capable of doing it – don’t hesitate to call up an expert! Although operating a LED light is simple, there are some brands and models which are more elaborately designed. Think about it – do you really want to sacrifice time and hassle with access controls, just because of a little amount of light in your aquarium? There are different grades of LED lights and you should ask yourself about how much money are you willing to spend. Most models last to about 30.000 hours give or take. A bigger investment means more hours. Do you want to set the changes of intensity on automatic? Do you need different colors? Do you want flickering modes on? There are all legitimate questions and they all yield extra money if you wish to purchase LED lights for your aquarium. What are the exact measurements of your tank? You should be aware of the fact that different sizes require different lights. You wouldn’t want to overspend because of a miscalculation. Different kinds of plants and animals require various light intensities to be able to advance in growth and health. Make sure you inform yourself about the parameters in order to provide your fish and plants with the ultimate features to be able to grow! Some people like different colors, whereas some prefer the plain white LEDs. After you decide on which spectrum of lighting your wildlife can grow the most – it all comes down to preference! Make a compromise between your wishes and the money that you are able to spend. This will create the ideal choice and everyone will be happy with your new LED lights – both you and the fish! After you have all the necessary knowledge and the guidelines, it’s time to round up the contenders for the title of the best LED lights for your aquarium. The competition was fierce, nevertheless, a sound decision was made in the end. COODIA once again proves its reputation when it comes to being the leader amongst lighting manufacturers. 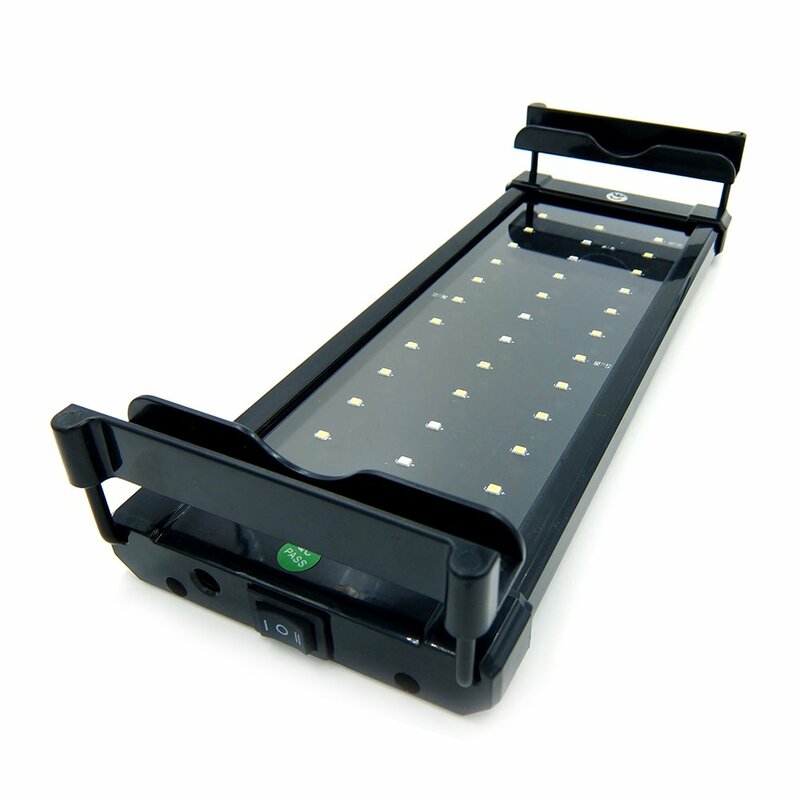 Simplicity and durability are the integral parts of this LED aquarium light. Unlike some models, this COODIA LED light gets bonus points for simplicity – you just set the light up and plug it in. Don’t be mistaken, simplicity doesn’t mean lack of features in this case. Dimmable lights with interchangeable colors and intensities are just what you need to make your reef tank one of a kind. Everything is pretty much explained in the manual – so there is no rocket science involved. What’s awesome about it is that it has an adjustable, extendable bracket that can fit any size from 30 cm, all the way to 50 cm. A rare sight indeed. Very reasonable price for a quality product. Uses a very small amount of energy compared to other models. Extendable brackets for different sizes. One of the most customizable options on the market, it has many lighting modes. Fits only a 5-gallon tank. Not fit for 10-gallon tank. White light is not very bright. 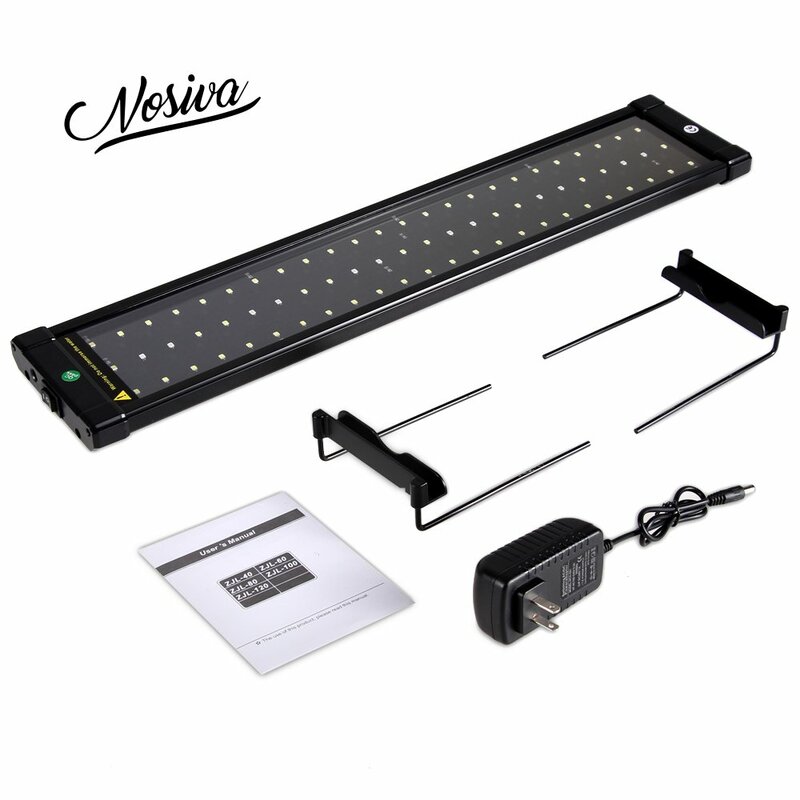 NICREW once again proved that they belong to the conversation for the top aquarium LED lights manufacturer and it’s really not that hard to see why and how. Out of all the models that we tested, this NICREW LED lights manifested the highest brightness parameters, as well as the smallest amount of heat produced. The real deal here is the magnificent light adjustment for growing plants. The lighting system is equipped with blue and white LEDs for daylight adaptability, whereas you can turn on the special nocturnal system during night time. What may disappoint some users is that it’s not very water resistant, but all in all – all the positives outweigh this lack of resistance, so it does not really matter. Comes in a plethora of sizes and all perform equally well. Energy efficiency is pretty high and expends less energy than most models. Yield excellent results with plants of all sorts. Only 2 light options- White and Blue. With this model, we can see the power of innovation in full effect. NOSIVA decided to create one of the ultimate LED lights for reef tanks and did so in spectacular fashion – by adding 72 LED lights! This large number is unheard of when it comes to LED lights for smaller fish tanks or reef tanks. They are concentrated on a small surface so that the plants and the fish can get the ultimate growth possibilities. Again, we have the lack of water resistance, which can be a small speck on the impeccable reputation of this LED lighting system. 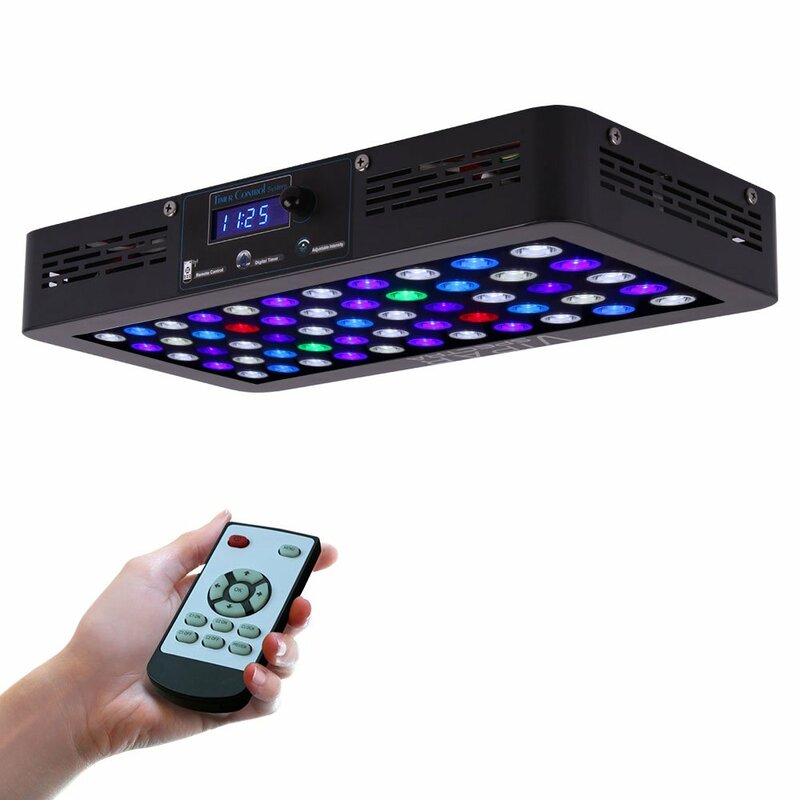 With adjustable metal brackets, a big light hood and an energy saving program, you won’t have to worry about submerging this amazing LED system into the water. It practically possesses all the necessities for a good growth program, with increased ease of operation in comparison to other models. A large number of LEDs for efficient growth. Adjustable brackets to fit the aquarium. Extends the least amount of energy out of all the candidates on the list. Very reasonable price for a fairly large LED lighting system. The lighting is adequate but not ‘very’ bright. There is no stopping mechanism for the extendable arms. We are now venturing into the real hi-tech territory and in amazing fashion.This LED lighting model has all around customization options and adjustability available. We can say that their idea performed quite well. During the testing, it showed the most stable set up out of all. It’s been a favorite amongst customers worldwide because of the size options it can be ordered in. You will have a much better reef tank set up with this LED lights. The main reasons for that are the 24 hours on and off period, the automatic dimming down and much more modes for different plants. It’s a wise investment because it can last many years, even when changing plant species and different fish. All in all, it losts out on the first place because it’s objectively the most complicated LED light to operate, out of all the models in the list. Can change modes according to the growth phase of the plant. Light begin flickering after months of usage. It can be difficult to program the light sometimes. The deserved champion is this amazing VIPARSPECTRA model. It takes home the crown in spectacular fashion, after a hard battle at the top. Although the price seems high, the overwhelming amount of features simply blows any financial downside straight out of the water. It has an unbelievable spectrum of light with a special mode that allows every section to be completely independent of the main setup. This is a major advantage for all reef tank owners, simply because it allows customization and focus on different parts of the aquarium – something other LED lights simply don’t have the ability to do. Photosynthetic corals, algae and lots of exotic fish thrived under this light and we were delighted with the spectacular results. Amazing color and dimming options. Versatility when it comes to different sectors. Can literally enhance the growth of anything. Does not have a purple light. Gives a blurry haze off the rocks. LED lights really are an important part of every reef tank setup, as they add an incredible aesthetic feature to an already carefully set up ecosystem in the tank. All the models on our list are top notch, simply because it’s very tough to crack the top five in such a competitive market. Therefore, any model will do – it all depends on your preferences. 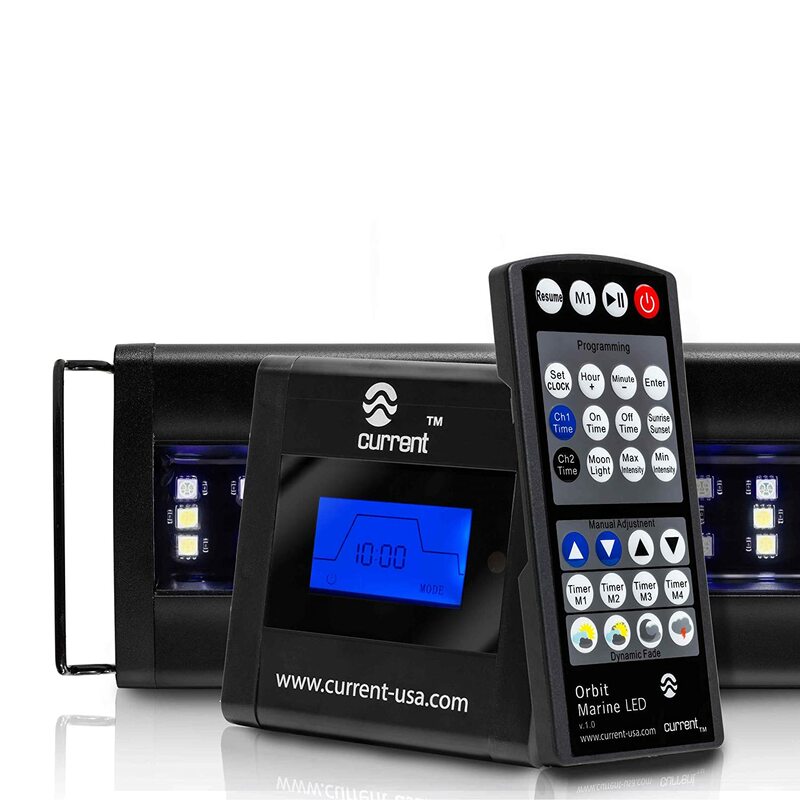 If we had to recommend only one, it would be the Current USA Orbit Marine Aquarium LED Light, as it possesses the ideal price and quality options for growers of all types. The VIPARSPECTRA one is also stellar, but it may prove to be too much of an investment for beginners. Whichever model you choose, it will serve you well, so – it’s up to you! Good luck and may your plants and fish grow to be big and healthy!